It is an event where velocity and speed are measured with sweat and muscle instead of a JUGS gun. It is a combination of the holiday celebrations that within the last five years has been a welcome relief from the cold harsh realities that face this region. The warmth and comfort surrounding the gathering is not only felt from the heat of ovens and stenos but from the laughter and compassion shown by one of the Tampa Bay area’s biggest hearts. 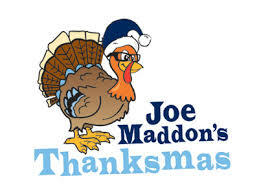 When the temperature begin to dip a bit here in Florida, it is a key signal that it is time again for the mass of Tampa Bay Rays office staff, players, broadcaster and coaches to assemble with their leader, Rays Manager Joe Maddon to begin the joyous holiday tradition of Maddon’s “Thanks-Mas” celebration. 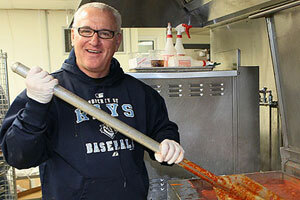 This holiday season, Maddon and his every increasing band of Merry Men and Women will again assemble at the kitchens deep within the confines of Tropicana Field on Monday to begin the preparations on their annual Italian holiday feast of providing hundreds of portions of authentic Maddon inspired classics such as his Mother Beanie’s succulent meatball recipe and home made pierogies. 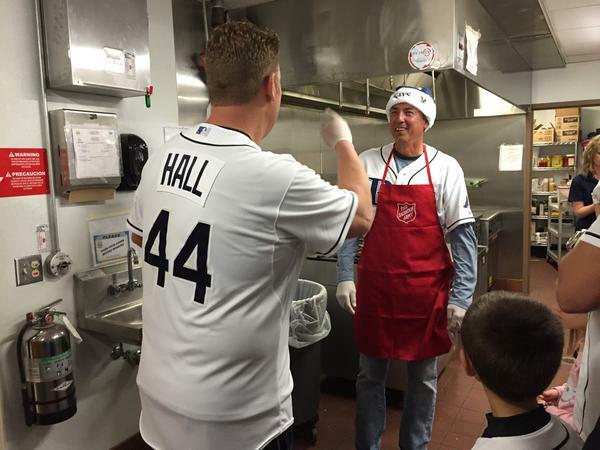 As usual, Maddon and his crew will prepare, transport and serve the meals to the less fortunate at the Salvation Army locations in Fort Myers (12/14), St. Petersburg (12/15) and Tampa (12/16). 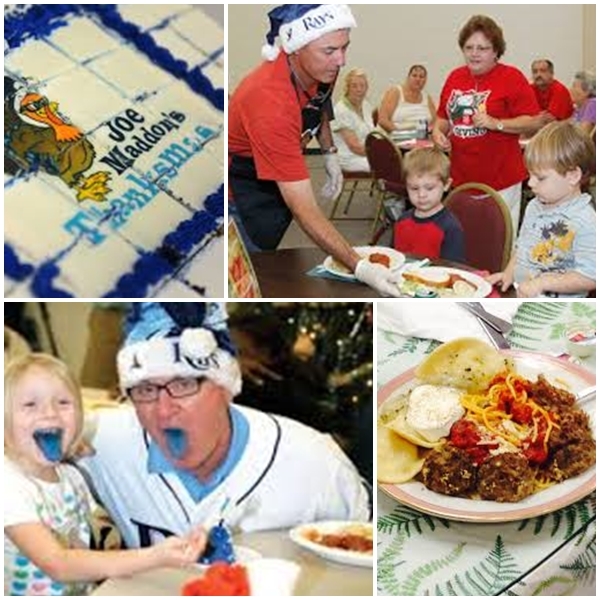 Maddon will also expand his journey this year to one more special location when he ventures to the local St. Petersburg Sallie House, on December 13,2010. The Sallie House is a local St. Petersburg safe haven for children up to the ages of 11 who have been removed from their current homes because of expected abuse, neglect or abandonment. Children may stay at the Sallie House as long as needed – for a few hours or even several months – until they children can be safely reunited with their parents, placed with supportive relatives, or taken into a local foster home or adopted by a loving family. 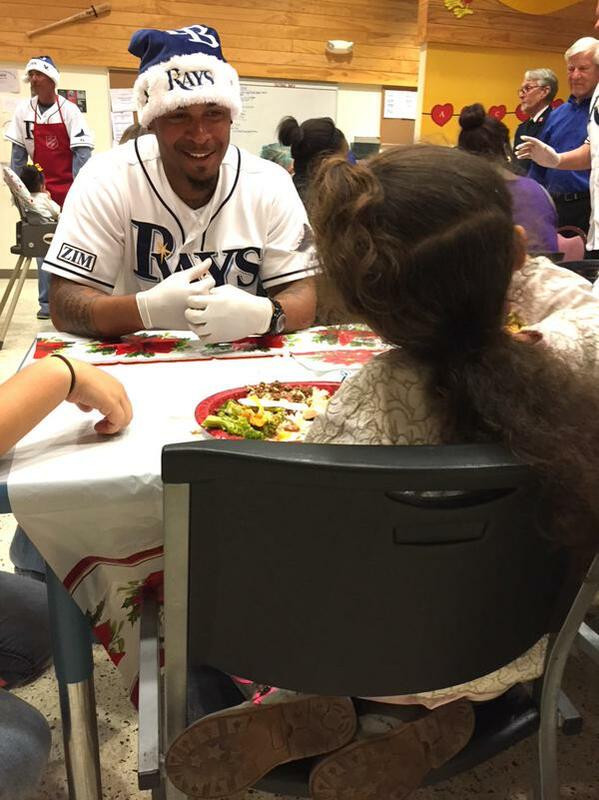 Doesn’t seem like it has only been five seasons since Maddon came to the Rays as their Manager and instituted this ever increasing holiday fest that has grown in size, importance and is a highly anticipated event by the community and the Rays each Winter. 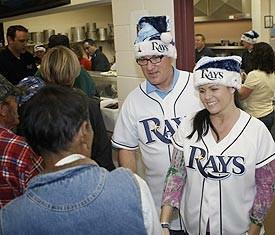 Over the past four celebrations, Maddon and his Rays elfs have helped feed over 3,000 Tampa Bay citizens who might be struggling or displaced by the region’s economic struggles. Each year you can see Maddon enthusiastically orchestrating both the kitchens and the serving area like a conductor on the podium. 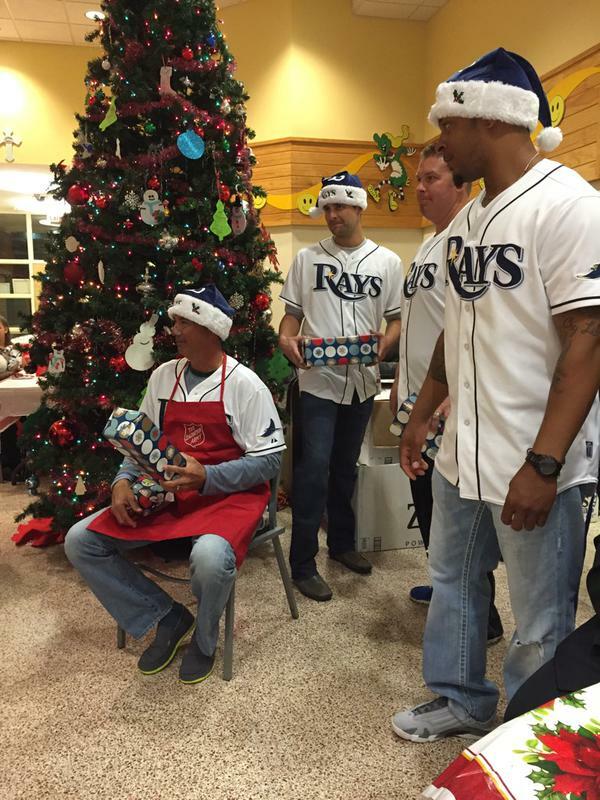 This season some of the guests of Thanks-Mas will also be given the gift of a Tampa Bay Rays ” Hoodie” sweatshirt . 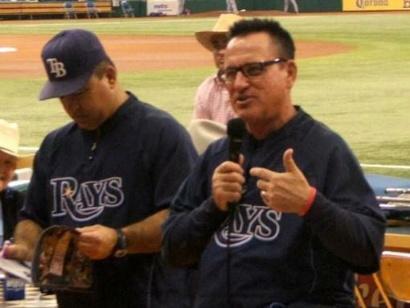 The clothing item was made famous by Maddon when MLB sent a notice to Maddon following him wearing the royal blue colored hooded sweatshirt during a televised Rays versus Boston Red Sox series at Fenway Park in April 2010. Several later “Hoodie-gate” was resolved and Maddon again was seen on the dugout steps wearing the royal blue pullover hooded sweatshirt during the Chicago White Sox series. “Thanksmas” can actually be found in the Urban Dictionary as ” a non-religious holiday observed by friends, not family who are unable to be together for either Thanksgiving or Christmas.” What could be more appropriate this time of year than getting together with co-workers celebrating the past years successes and failures along with the invitation of great food. Maddon take his annual celebration to the next level by doing all of the grocery shopping and visually supervises the cooking firsthand so that the integrity and authenticity of his past holiday memories forged in Hazelton, Pennsylvania can be enjoyed equally by his old and new friends within the Tampa Bay community. 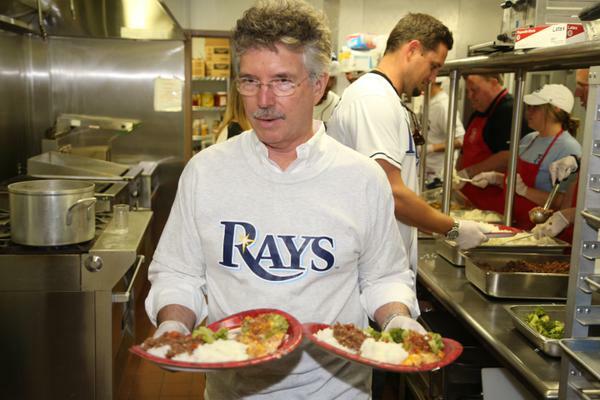 I know it is a Rays post season celebration I look forward to every year not for the food and possible gifts, but for the pure joy of giving and sharing with a community Maddon also calls home.